Twinmaster: "sparked the low-wattage revolution in guitar amplification"
Budda Amplification has reissued the low-wattage Twinmaster combo, first released in 1995. The 18-watt guitar amp has a simple feature set - single volume, treble and bass controls - and two inputs (Normal and Hi gain), all hand-wired in the USA. Budda Amplification announces the return of the Budda Twinmaster, the legendary amplifier that sparked the low-wattage revolution in guitar amplification. The hand-wired Budda Twinmaster is a reissue of the groundbreaking amplifier that debuted in 1995. 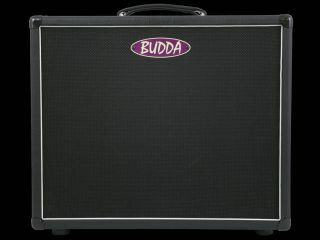 The Budda Twinmaster is a dynamic boutique amplifier with a straightforward feature set in an 18-watt combo format. Completely hand-wired in the U.S.A. with high-grade audio components, the Twinmaster features a hybrid layout that combines a turret-board hand-wired 12AX7 preamp and a point-to-point hand-wired EL84 power ampwith a 5U4 rectifier. be dialed back by trimming down the guitar's volume control. Amenities like a Slave Output and Effects Loop add modern convenience to the Twinmaster's classic vibe. The Slave Output is connected in parallel to the speakers and sends a padded, non-powered signal that can be used as a direct output for live or studio recording. A separate, powered Speaker Output can be connected to a specially tuned Budda extension cabinet, or another loudspeaker enclosure with the proper impedance rating. The Twinmaster chassis is loaded into a solid, finger-jointed pine enclosure, equipped with a single 12" Budda Phat loudspeaker, and finished with a striking black Budda covering, matching metal corner caps and classic white piping.